I got some free time yesterday after a busy weekend so I decided to try some new water. My stream of choice was the East Branch of the Saco. As usual, I stopped at North Country Angler for advice and flies and I was on my way. I worked my way up to the headwaters to search for some of the stream's many native brookies. The spot where I pulled over and fished looked perfect, with a series of cascading plunge pools. Unfortunately, the fishing started off really slow as several decent spots failed to produce. I attributed it to high water from the recent rain and sunlight but didn't see any fish spook at the same time. My luck began to change as I hooked and lost a decent fish behind a large rock in a swirling pocket. Eventually, as I worked my way up, I saw a decent fish jump in an undercut. A couple of careful casts later, I coaxed a stocked brookie into taking a pheasant tail nymph. Landing it was another matter as it fought as if it knew every snag and boulder. I even had to chase it downstream to bring it to hand! Soon after, I broke off my rig so I switched over to dries. Soon after, I brought some more stocked fish to hand. While it was rewarding to see them come up slowly and sip a properly presented dry, I was bummed to see the dearth of natives in this stretch. I picked up some more stocked fish before I finally got into natives. It was interesting to see the progression from stockies to natives. 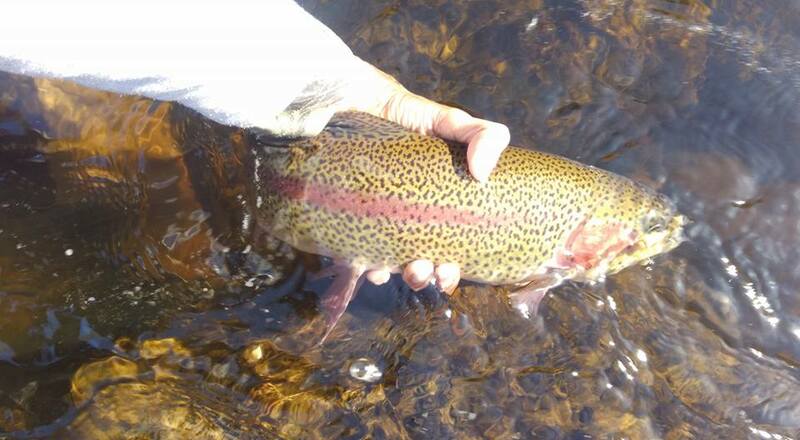 Fish were caught on both dries and nymphs. I fished nymphs in the faster, broken water and dries in the calmer stretches. Whenever one technique did not produce, another did. At one point, I even sight nymphed a fish that came up to look at my dry only to refuse it. I saw the fish wasn't spooked since it was actively nymphing in its feeding lie even after multiple subsequent drifts. As soon as I switched up to a nymph rig, I saw it shift, take, and it was on! All said and done, I managed to catch a dozen trout: 5 stockies and 7 natives. It wasn't a numbers day by any means but it was fun to beat the tough conditions and catch some memorable fish. I feel that this river has great potential if they didn't stock over the natives but this horn has been tooted more than once without any real action taken. At least the drive through the Kancamangus highway was something else and my chicken salad didn't taste half bad either.